Let our Gammill Classic long arm quilting machine, with its Statler Stitcher software, turn your patchwork into a beautiful heirloom quilt in a smoke and pet free environment. Artisic Quilting specialises in low-cost, fast turn around edge to edge with a large range of quilting patterns to choose from. high quality and competetively priced wide backing fabrics are available via Widebacks Australia. Tell us what you want and we can arrange for the minimum amount to be delivered to us. Any surplus backing fabric will returned to you along with your quilted top. 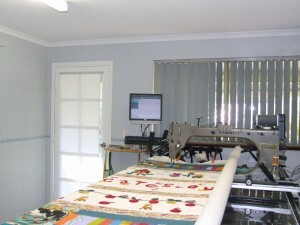 A custom quilting service is also available for that extra special project. Please refer to our Requirements page. The goal of Artistic Quilting is to provide a first class long arm quilting service for people who love the art of patchwork and desire their work finished to a high standard. For the current range of quilts available for this service see our Quilts for Special Occasions. If you would prefer an already finished quilt an additional label can be added with your details, other than the naming of the quilt; there is an extra charge of $30.00. The labelling of quilts has a history as long as quilt making and it very important should valuation be required at a later date. As all of our quilts are unique, handcrafted artworks, they are gifts to be treasured at prices well below realistic valuations.